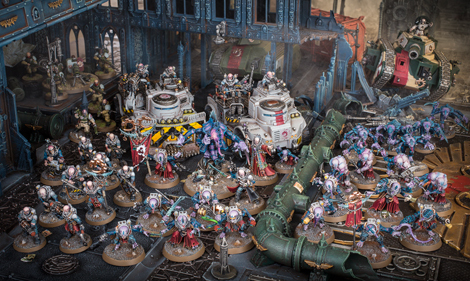 Part 2 of my 8th edition Genestealer Cults codex review will take a look at the great new stratagems available to the army. Clandestine Goals (1CP)- If the mission you are playing uses Tactical Objectives, you can keep your objectives secret from your opponent until they are scored. This is similar to the Dark Angels stratagem allowing you to keep the cards drawn a secret. I'm a big fan of maelstrom games and this is a huge boost, keeping your opponent guessing as to what you are trying to achieve each turn. I will probably use this one in most of my games. Lurk in the Shadows (2CP)- Play at the start of your opponent's shooting phase on an Infantry unit that is entirely in terrain. Until the end of the phase, enemy units cannot shoot the unit unless they are the closest visible target. A strong stratagem to help keep a unit in cover safe from enemy firepower. I can see this being of use if you have a unit holding an objective in cover to stop your opponent from shooting them off of it to stop you from scoring points. Also good for a Lascannon Heavy Weapons squad sitting back in cover to help keep your anti-tank firepower safer. I don't see it being used all too often, but could be very strong in the right circumstances. They Came From Below (1CP)- Use before revealing a Cult Ambush marker. Up to 3 units (excluding vehicles) from your army can be removed from the battlefield and set up underground as described in Cult Ambush. A strong stratagem for putting more of your units in reserve after deployment. This allows you to get selected units in a better position if you have not placed the ambush markers well, or your opponent has gone for a refused flank. Also, would allow you to pull a fake refused flank, getting enemy units out of position before the game starts. Broodcoven (1CP)- Used if your warlord is a Patriarch. This allows you to select one Magus and one Primus in the army and give them warlord traits (all three must be different). A nice bargain for 1CP, as Genestealer Cults have some useful warlord traits that they can access. For example, you can increase the range on any aura abilites by 3". This would be useful on the Primus, giving him a 9" bubble that gives units +1 to hit in the Fight phase. 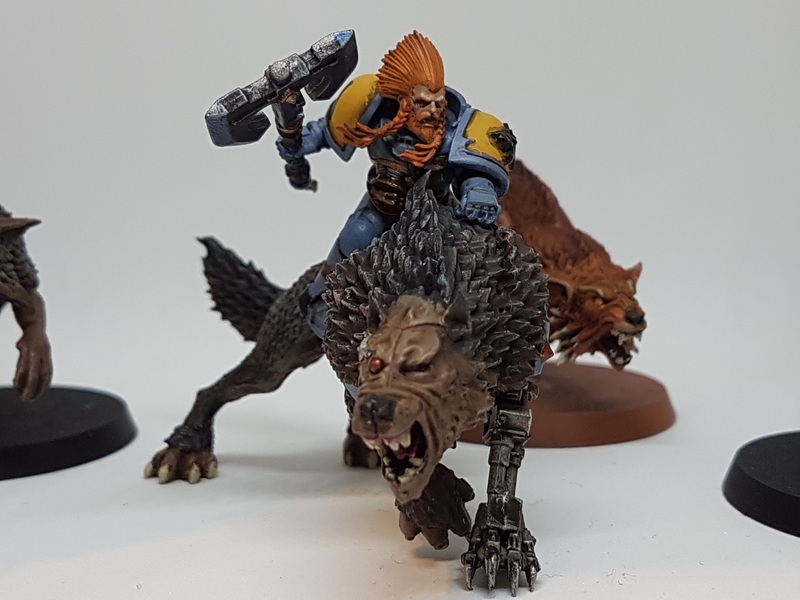 Devoted Crew (1CP)- Use on a Genestealer Cults vehicle. For that turn, use the top row of the damage table when determining how many wounds the model has left. A nice stratagem for boosting the combat effectiveness of a vehicle for a single turn, either allowing the vehicle to move at full rate or fire at full effectiveness. Very useful on a damaged Cult Leman Russ, allowing it to fire at full BS when you use the stratagem. Great if your opponent gets the first turn and is able to severely damage it. You can use the stratagem to get one turn of good firepower from the unit. Monstrous Vigour (2CP)- Use at the start of the turn. An Aberrant unit from the army adds 1 to Bestial Vigour rolls. This will give the unit a 4+ save against any wounds caused in most situations. This is a nice bonus of the Aberrants, as they already reduced the damage of weapons that wound them by 1. 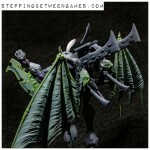 Nice for the Abominant as well to help keep it alive for longer. Meticulous Uprising (1CP)- Use before you reveal an ambush marker. You can move three ambush markers up to 12", as long as they stay in your deployment zone and at least 9" from an enemy model. 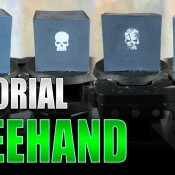 Along with They Came From Below, this gives you more tricks to play with the Cult Ambush markers. This can give you some serious options to deal with your own deployment options or to react to your opponent's deployment. I can see this being a useful choice. Remember, the unit can move and shoot as normal after being revealed, so this can potentially give you an extra 12" move on a unit. It is a bit more limited as you cannot move outside of your deployment zone. Hyper-Metabolism (1CP)- Use at the start of the movement phase, a Character heals D3 wounds. A very nice stratagem for keeping your characters alive for a bit longer. Along with the Character rules and the Unquestioning Loyalty ability, this should help keep your characters alive for even longer. Rigged to Blow (1CP)- Use when a Genestealer Cults vehicle is destroyed that is equipped with Demolition charges. The vehicle automatically explodes. The Demolition charges at a 10 pts upgrade for a vehicle, so not a big cost. They also give some close ranged firepower for a unit inside the vehicle. Automatic explosion is nice for damaging nearby enemy units, allowing you to do D3 mortal wounds. Useful when it comes off, but not going to happen too often. 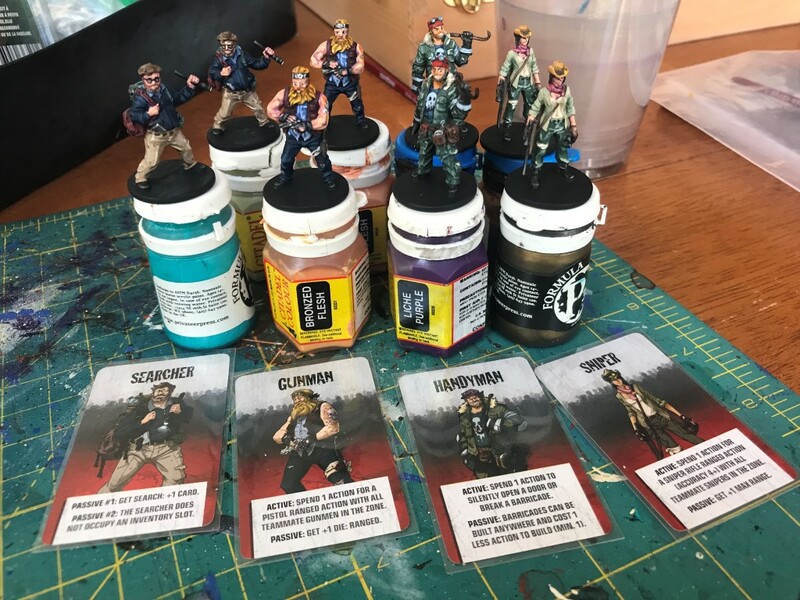 The First Curse (1CP)- Use before the battle on a Purestrain Genestealer unit. Roll a D6. On a 1-2, each roll of a 6+ to wound in the fight phase causes an additional point of damage. On a 3-4, add 1 to advance and charge rolls. On a 5-6, the unit gains a 4+ armour save, but loses the Swift and Deadly rule (allowing them to advance and still charge). Can only be used once per battle. I don't actually think this one is all that impressive. I think the roll of 5 or 6 is the worst result, as you lose the ability to advance and still charge. Getting +1 to charge and advance is nice to give you a good bonus from getting into combat, and the volume of attacks makes the 6+ to wound result potentially damaging. Not sure I would use this all too often though. Cult Reinforcements (1CP)- Use at the start of the movement phase. Select a Genestealer Cults unit from the army that is Troops. You can return up to D6 slain models from the unit, set up in coherency, at least 1" from an enemy model. This is awesome, allowing you to bring more models back to reinforce a unit that is in combat or has suffered from enemy shooting. It only works on Troops, which does limit its effectiveness a bit, but Acolyte Hybrids are still pretty strong in combat, so a nice bonus. Detonate Concealed Explosives (2CP)- Use at the start of the Shooting phase if theyre are any Genestealer Cults units on the battlefield. Select an enemy unit and roll a D6. Add 1 if the unit contains 10 or more models, subtract 1 if the unit is a character. On a roll of a 4+, the unit suffers D3 mortal wounds. On a 7+, it suffers D6 mortal wounds. This is a nice stratagem to potentially do mortal wounds on an enemy unit. You still need to roll a 4+ to have an effect, so may need another CP to re-roll the result. Could be useful for sniping at enemy characters who only have a few wounds left if you can roll the 5+. There are no restrictions against the enemy unit being in combat or out of line of sight, so useful for also targeting these units. Scanner Decoys (1CP)- Use when you set up a unit from Cult Ambush at the start of the game. You can place four ambush markers instead of one. When you have deployed all your units, these extra markers are removed with no effect. You can only use this once per game. A great stratagem for more deployment games. Getting an extra three markers to play with in Cult Ambush is great, giving you more deployment options for your army or more mind games to play with your opponent to keep them guessing where you are going to deploy. I can see this being a very useful stratagem to use in games. A Perfect Ambush (3CP)- Use in the movement phase immediately after setting up an Infantry or Biker unit from the army with Cult Ambush. That unit can either move D6" or shoot with all its ranged weapons as if it were the shooting phase. This used to be the result of a 5 on the Cult Ambush table. It is pretty expensive at 3CP, but could be worth it in most situations when bringing a powerful unit on from reserve. If you roll well on the D6, this could give you a pretty easy charge to make from reserve, especially when combined with the Creed giving you +1 to charges. It also allows you to shoot in your opponent's turn, as you must reveal your Cult Ambush units at the end of your opponent's movement phase. This could allow you to have a Lascannon Heavy Weapons Team target an enemy unit before they can fire, or can put up any psychic defences. I think this is a powerful statagem, but won't be used too often due to the expense. Telepathic Summons (2CP)- Use at the start of the psychic phase. A Cult Psyker model cannot attempt to manifest any powers. Instead, roll 3D6. You can add a new Cult Infantry or Biker unit to your army if they have the Cult Ambush rule and the power level of the unit is equal to or less than the roll. Immediately set up the unit on the battlefield more than 9" from enemy models. This is a pretty awesome ability to have, allowing you to take an additional unit. For reference, a unit of 5 Aberratns is 7 power, a unit of 10 Purestrain Genestealers is 8 power, a unit of 10 Acolyte Hybrids is 6 power. I'm not sure if you need to have spare points in your list equal to the value of the unit being brought in. If so, this is more limiting and will probably not see so much use in competitive games. Return to the Shadows (1CP)- Use at the end of the movement phase. One Infantry or Biker unit that has the Cult Ambush rule and is at least 3" from an enemy unit can be removed from the battlefield (can't be one that just arrived from reserves). They can deploy at the end of your next movement phase using the normal reserve rules. This can be useful if a powerful unit finds itself out of position, so you can re-deploy them to a more favourable position. It is also a nice way to keep a unit safe from your opponent's army for the turn. For example, if your warlord was threatened by enemy shooting or combat, you could fall back and remove them from the battlefield, coming back in a more shielded position in the following turn. Lying in Wait (2CP)- Use this stratagem when a unit is set up from Cult Ambush as reinforcements. The unit can be set up anywhere on the battlefield at least 3" from an enemy unit, but cannot make a charge move this turn. This is a very powerful stratagem for getting in close to an enemy unit and maximise your short-ranged firepower output. For example, you could equip a unit with Hand Flamers and fire on an enemy unit, or launch some demolition charges at an enemy unit when used in combination with the stratagem below. Extra Explosives (1CP)- Use when a Genestealer Cults unit shoots or fires overwatch. Up to 10 models may throw a grenade instead of only one model (only 5 of these may fire demolition charges). A very powerful stratagem when used in conjunction with Lying in Wait. An Acolyte Hybrid squad armed with Demolition charges could fire 5D6, S8, AP-3, D3 damage shots for a single turn. This could be a very strong combination for taking on an enemy vehicle or powerful unit in the shooting phase you arrive from reserve. There are also a number of ways to get bonuses to hit on an enemy unit, so this could be used in good combination with this, allowing you to hit on a 3+. Grandsire's Gifts (1CP/3CP)- This is the standard take 1 extra relic for 1CP or two extra relics for 3CP. The Genestealer Cults have access to some decent relics (as you will see in the next part of the review), so this could be useful to use every so often. However, I don't tend to go for extra relics in my army, so will probably avoid using this often. A Plan Generations in the Making (3CP)- Cult of the Four-Armed Emperor only. Use this stratagem after your opponent has spent CPs to play a stratagem and roll a D6. On the roll of a 1, your opponent's stratagem goes off as normal. On a 2-5, your opponent cannot use the stratagem, but get the CP back, on a roll of a 6, they cannot use the stratagem and lose the CP. 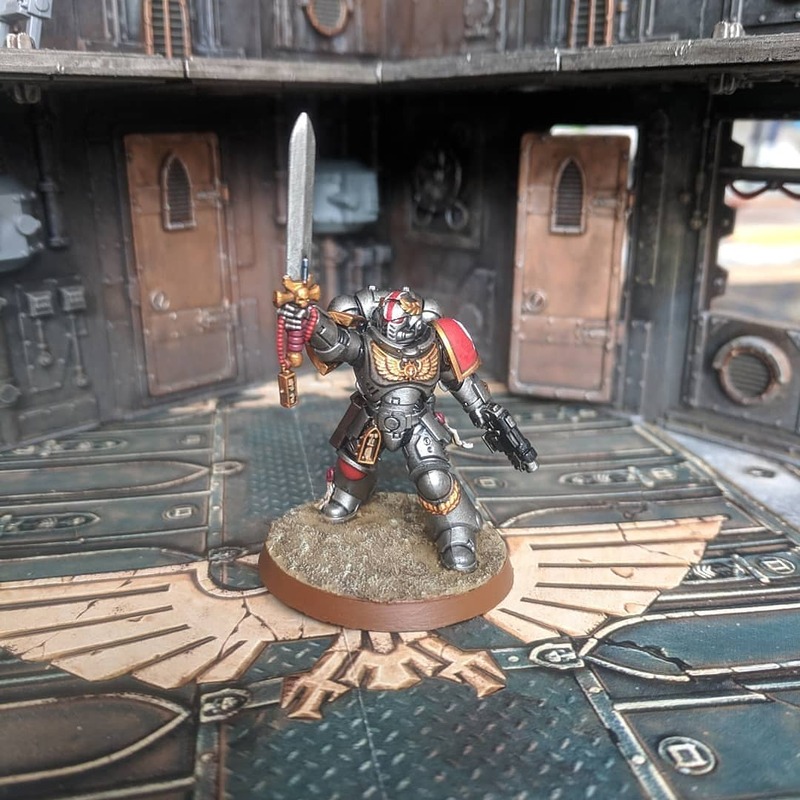 Cannot be used to effect stratagems used before the battle or during deployment and can only be used if there are Cult of the Four-Armed Emperor models on the board. 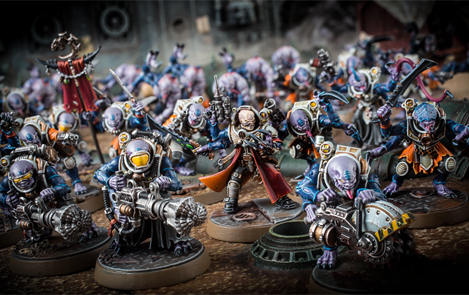 Genestealer Cults get their own version of Agents of Vect to use. This is an incredibly powerful stratagem and has the potential to seriously disrupt your opponent's plans. I've had Agents of Vect used against me many times to good effect, so am looking forward to being able to pull off those tricks myself. We also get it for the slightly cheaper cost of 3CP. 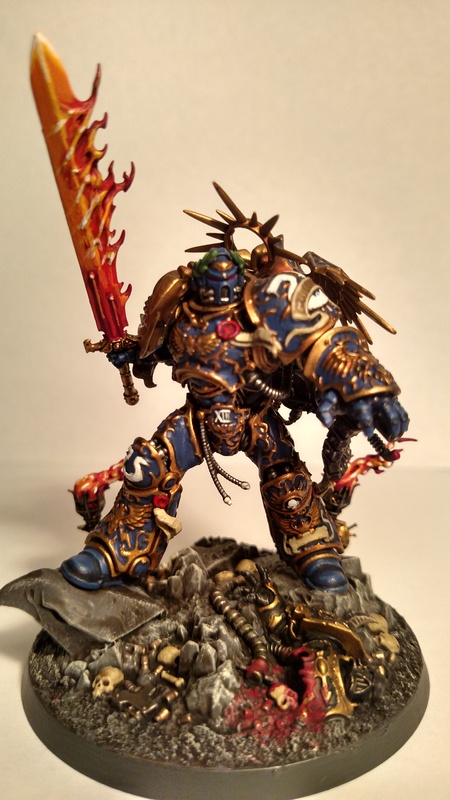 I think this stratagem is one of the reasons that the Cult of the Four-Armed Emperor will be one of the more popular Creeds to be used, simply off the power of this stratagem. EDIT- The FAQ has made this stratagem one use per battle only. It is still a strong stratagem and could help you at a key moment, but the utility is slightly reduced now, as you only get one go at it. Better hope you don't roll a double 1 for the result! Chilling Efficiency (2CP)- Hivecult units only. Use after a Hivecult unit has attacked an enemy unit in the shooting phase and the attack resulted in the enemy unit losing one or more wounds. Add 1 to hit rolls for attacks made by other friendly Hivecult units that target the same enemy unit in this phase. A nice bonus stratagem for when you want to maximise the firepower damage against a single enemy unit. Useful when used in combination with Demolition charges and the Extra Explosives stratagem. However, I still don't think Genestealer Cults are the strongest of firepower armies, so you may not get a lot of return for this stratagem. Overthrow the Oppressors (1CP)- Bladed Cog units only. Use when a Bladed Cog unit (excluding Genestealers) fights in the Fight phase. Until the end of the phase, each time an unmodified roll of a 6 to hit is made, the model can immediately make an additional attack with the same weapon (these hits cannot generate further attacks). These extra attacks can be made on a roll of a 5 or a 6 against Imperium units or on a roll of 4-6 against Adeptus Mechanicus units. This is an incredibly strong stratagem when facing an Imperial or Adeptus Mechanicus army. It's a shame it is on an unmodified roll of a 6, as a Primus still gives +1 to hit in the Fight phase. With an army that can be as close combat powerful as the Genestealer Cults, this is insane against the Adeptus Mechanicus. Once more, the Purestrain Genestealers seem to have been unnecessarily left out. 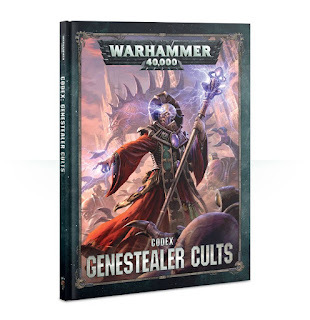 It's almost like they don't want you to take Genestealers in a Genestealer Cult army. Drive-by Demolitions (1CP)- Use before a Rusted Claw Biker unit shoots in the shooting phase. Until the end of the phase, add 1 to the hit and wound rolls made for attacks with that unit's grenade weapons. After this unit has resolved all of its shooting attacks, it can immediately made a move as if it were your movement phase, but cannot charge this turn. A useful stratagem for some hit and run antics with a unit armed with Demolition charges, or for some more accurate and wounding firepower. Also gives you a nice way to perform a double move to grab an objective or threaten an enemy position, moving the unit at least 28" in a single turn. Vengeance for the Martyred (1CP)- Use when an enemy unit destroys a Pauper Princes character. For the remainder of the battle, add 1 to hit rolls made by friendly Pauper Princes models when targeting the enemy unit that destroyed the character. A nice bonus to the rest of your army when one of your characters is killed. This works for hit rolls in the shooting and fight phase, so lots of opportunities to take advantage in your army. Monstrous Bio-Horrors (3CP)- Use at the end of the fight phase. Select a Twisted Helix Aberrant unit from your army. They unit can immediately fight again. In addition, until the end of the turn, subtract 1 from the Leadership of enemy models when within 6" of the unit. Aberrants can hit pretty hard in combat, more so with the +1S from the Twisted Helix creed. This is a powerful stratagem for them. It's just a shame that it applies only to Aberrants from a single creed. I would have liked to see a generic 3CP fight again stratagem that most armies tend to get these days. As you can see, the Genesteaeler Cults have access to a number of useful and powerful stratagems. They have several that can be used to manipulate the Cult Ambush, which should lead to some interesting tactical options that I am looking forward to trying out. There are none that seem ridiculously overpowerful to me initially, except for maybe A Plan Generations in the Making, which is a strong stratagem. There also don't seem to be any that are pretty weak from the offset, just ones that I don't see myself using all too often. Yeah, I can see that being a powerful combination to use for the Acolyte hybrids. Especially as Hand Flamers have dropped to 1 pt each. I think the Plan Generations in the making is not really OP, it is expensive at 3CP and still has the chance 1in6 of fluffing, but will be useful to prevent those Blood Angel "On Wings of Fire" moves amongst others! I am very much looking forward to messing up the opponents deployment by moving blips, faking blips and returning to shadows. I will defo try the handflamer or Demo Charges squad with Lying In Wait and Extra Explosives - taking 10+ wounds of a Landraider or popping a Dread or something would be very fun, you can then Return to Shadows if its way out on the flank to use them again somewhere needed. It is a great stratagem for throwing a wrench in your opponent's plans for sure. There seems some quite good stratagems in there and there are none that strike me as completely useless. I suspect that the telephonic summons stratagem will require points to be set aside, in the same fashion as "send In the next wave" for Valhallans. If they rule that it doesn't, then there are going to be lots of very annoyed guard players out there. I would agree, that is most likely what is going to occur. I don't see it being used all that often in that case. Because they can't move Markers outside your Deployment Zone, the various Stratagems for messing with Cult Ambush, as you note, aren't really useful for getting quick Charges or anything, but they should be great for shuffling things out of LoS, or picking up LoS for your own firepower Units, or pulling a surprise Refused Flank/Split Deployment. Part of my issue with Rigged to Blow is that only a couple of Vehicles even have the option for a cache of Demolition Charges. I'd like to be able to pull off that sort of thing with Sentinels and Ridgerunners and such, too. A Perfect Ambush: Don't forget the potential with a Clamavus as well as the 4-Armed Emperor Creed. 6" Charge at worst, and more likely significantly less than that. Telepathic Summons: I thought there was something in one of the FAQs that said that effects that create new Units always require Reinforcement Points. Even given that, the more I think about it, the more it seems like it might actually be worth setting aside 60 or so Points for it. That's enough to pick up any of the Support Characters, either as a replacement if needed, or for flexibility in which you want in any given Game. Also can be thought of as 2CP to delay bringing in a Unit from Reserves until Turn 4-6 despite the usual restrictions. 5 Acolytes or 10 Neophytes, even with no extra gear, are more than capable of making a late-Game Objective grab, and/or clearing a small remnant Unit off of one, or grabbing Linebreaker or something. Could also be used to circumvent the Rule of Three for cheap stuff like Atalan Jackals or Brood Brother HWSs. Return to the Shadows: Again, also great for late-Game Objective grabs and such. Lying in Wait: Just the threat of this one is great. Possibly even more so than its actual use. Just knowing that you have the option means that properly screening requires keeping the lines 6" or so apart, instead of the ~18" needed to block out usual Deep Strikers. That's going to cut way down on the amount of the Board that can be zoned out. Agreed, moving the markers to get into optimal firing position is going to be great. Allows you to ignore the penalties for moving and firing. Yeah, rigged to Blow only has two options really. Would be great on some suicidal Sentinels. I think Telepathic Summons has some nice utility for replacing characters as you have pointed out. They are cheap enough that you are not wasting a ton of points on them. You just need to keep the psykers alive long enough to make use of them. Oh, also, on Devoted Crew: This is another one where the threat of it is potentially even more useful than actually playing it. Just the fact that this exists makes Goliath Rockgrinders a serious threat with even a single Wound left. And combined with Rigged to Blow, it might be possible to set up some tricky "damned if you do, damned if you don't" situations there. Yeah, Rockgrinders got a number of useful buffs in the codex, which I'll be covering in my Heavy Support section.